On the night of July 4 – 5, while people in the United States were watching fireworks, transgender women were brutally attacked in Cali, in southwestern Colombia. In a separate attack on the same night, another group of transgender women were attacked and two were injured, one fatally, after being attacked with knives. The second woman had to be taken to the hospital due to her injuries. As horrible as this violence is, it is shockingly and brutally frequent. As of July 2015, the Santamaría Foundation, a local NGO, documented four killings of trans women in Cali that year, and 68 killings since 2005. Colombia Diversa, a national human rights NGO, had documented 15 killings of trans women as of July 2015 in the country as a whole. Unfortunately, such violence against transgender people is all too common around the world, including in the United States. Since 1999, when activists called for a day of remembrance for transgender community leader Rita Hester who was murdered in Boston in 1998, November 20 has been set aside as a day to remember and commemorate the people who have been tragically lost to anti-transgender violence. As of October 2015, sixteen transgender people in the U.S. were killed that we know of, but it is widely accepted that more attacks and murders remain unreported. Around the world more people suffered and lost their lives because of this violence. 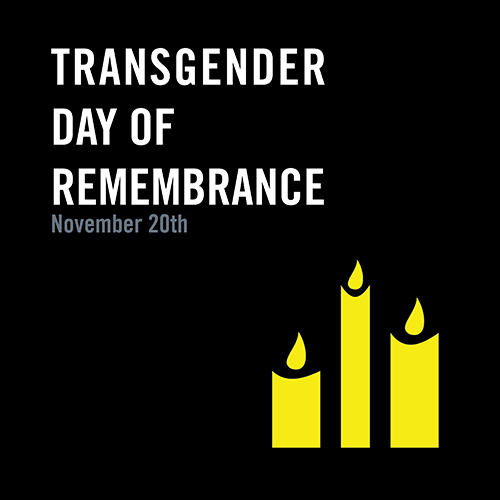 For a list of the names and information, visit the Transgender Day of Remembrance website. Amnesty international believes that every person, regardless of their real or perceived gender identity or their gender expression, should be able to enjoy the full range of their human rights, without discrimination. Violence and discrimination against transgender and gender non-conforming people grossly violates their human rights. The rights of people who identify as transgender or who are perceived to be transgender are also violated in terms of access to healthcare, education, housing, employment, legal documentation, and more. Take action to demand an investigation into the violence against trans women in Colombia. Participate in a Transgender Day of Remembrance vigil or event in your community. Learn more and organize in your local or student group by downloading the Amnesty International USA LGBT Ally Toolkit. As trans rights activist and writer Joanna Cifredo told Amnesty activists at our Mid-Atlantic Conference in November 2014, “One voice shouting doesn’t make a whole lot of noise. But a whole group shouting makes a difference.” Join us; raise your voice! This entry was posted in LGBT Rights and tagged #tdor, Equality, LGBT Rights, Rita Hester, transgender, Transgender Day of Remembrance by Guest Writer. Bookmark the permalink. I think that every person has the right to live their life by their won will and this has been their universal right. So let the people celebrate these types of special days for them.